If you're seeking a quick, fun, and meaningful way to look inward, working with oracle cards could be an enriching practice for you. 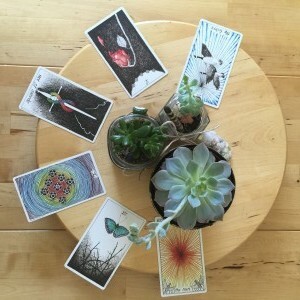 The simple act of choosing a card (or a few cards) is an immediate way to invite self-reflection, whether you are starting your day, pondering a lingering question in your life, or invoking nighttime dreams. Oracle cards generally come grouped into a deck, and they can provide us with insight into our innermost questions -- not from some outside source, rather from our inner wisdom used in deciphering their message. Tarot cards are one well-known example of an oracle card deck, though there are many other types. You don't need to be a professional tarot reader, a shaman, a believer of woo-woo, or anything other than exactly who you are to make oracle cards part of your practice. All you need is a favorite deck (or you can even create a deck yourself using your own art and/or images cut from magazines.) 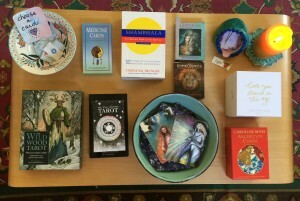 A few of my favorite oracle card decks I keep around my studio are pictured below, and many can be purchased via the Amazon affiliate carousel at the bottom of this post. After you pull a card, study it closely. If you have a deck of words (like the Angel card or Blesssing card decks in the carousel below) or phrases on the card (like the Shambhala deck or Danielle LaPorte's Truthbomb deck,) then see how/if this word or phrase could apply to your life. If your deck is comprised of cards with images, really look at the card you pull. What is pictured? What colors are used? Is there movement or stillness? Is there a person(s) present? Are there animals? Which natural elements stand out: fire, water, earth, air? Simply describe what you see. (We art therapists call the practice of just describing what you see "the phenomenological approach to the image" - fancy huh?) Describing form/the image leads to content/the meaning. Now it's time to let your mind free-associate and play! Does your card remind you of anything or anyone in your life? Could it apply to the question you asked as you shuffled? What do the words or colors or shapes mean to you? (i.e. ; "yellow reminds me of the sun and happiness" or "owls make me think of nighttime and wisdom" or "the word 'patience' is such medicine for me right now.") At this point, you may choose to make notes in your journal. If your card comes with a booklet describing the images (as tarot cards and other decks often do,) you might choose to then add this collective wisdom into your own personal reflections. Though, I'd recommend saving the booklet for last so as not to cloud your intuitive hunches. You might also pull 3 cards in a row, representing 1) Who I was, 2) Who I am, and 3) Who I will become. You can get creative about what sets of cards can mean, or you can consult the booklet that comes with your deck to see what types of readings are recommended. This practice can be infused with any energy you give it: light, fun, sacred, deep, meditative, inspiring... and the best part is that you can connect with yourself and your inner voice in under 5 minutes when engaging in oracle card reading. Trust the process.